round the rails we go: Like Playaway, but with less Brian Cant. Like Playaway, but with less Brian Cant. Bad news for anyone too young to buy a scratchcard. From today, you won't be able to get the same empty thrill of rubbing off a bit of foil for very little gain from a Saveaway any more. They're on their way out. Presumably this is a much overdue attempt to bring the Saveaway ticket into the 21st Century. It's always been a brilliantly anachronistic, and charming, little item. 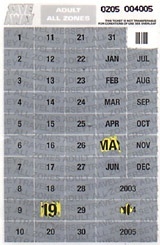 You have to scratch off the day, month and year you're going to use it, so they can be stored months in advance, and then fold a piece of sticky backed plastic down over the card to seal it. No matter how hard you try, no matter how long you spend on it, no matter if you are using a robot in an air-tight vacuum, you will always get a big crease in the plastic. They're specially designed that way. Thousands of tiny microfibres, invisible to the eye, are inlayed into the plastic like velcro, and they magically draw together as soon as they detect oxygen. It cost Merseytravel billions of Council Taxpayer's money to come up with this innovative polymer, but they agreed it was worth it because the look of frustration and anger on people's face as they fold it over is frigging hilarious. CCTV footage of people trying to not get a crease in their Saveaway is usually the highlight of the Christmas party at Merseytravel Towers. Usually this crease will go over the date, so the ticket inspectors will have to give it an extra squint, to enhance the comedy humiliation. The Saveaway's a brilliant idea, and an absolute bargain. If you're planning a day trip to, say, Southport, or New Brighton, it's worth getting a Saveaway just for the freedom it affords you to leap on and off trains and buses. It's also worth bearing in mind that it's valid on the ferries, though they keep that quiet at the terminal to try and get you to pay again. The move to a train-ticket-style Saveaway means that it can be used in the ticketing gates at seven of the stations, freeing up a bit of capacity, and leading to more thorough checks. And since it's computer printed with the date, it'll also mean an end to those chancers we've all seen on the trains, saying "Oh, I just forgot to scratch the box off" to the inspector, while wielding an untouched Saveaway that's clearly been kept in their back pocket for a couple of months. While the bus technology remains behind its train equivalents, we won't be seeing a complete end to the scratch-and-stick Saveaway; it'll probably be around until Merseyside gets its own version of the Oyster card. Which by the looks of it, probably won't be until the dawn of the next millennium. The move to a train-ticket-style Saveaway means that it can be used in the ticketing gates at seven of the stations, freeing up a bit of capacity, and leading to more thorough checks. Apparently, in a brilliant bit of forward thinking, the barriers have not yet been reprogrammed to accept the new tickets, so you'll have to wait to experience that particular advantage. I was tempted to go exploring today with one, but with half the Northern Line closed for engineering work there's no point. Looking forward to lots of confused bus drivers today! The former Golden Voice of Merseyrail has taken Monday off, so as to not have to repeatedly explain the change to various frustrated members of the proletariat queuing at the window, then returning to the window when the bus driver sends them back. The first time I remember a Saveaway ticket was when my Mum took me and my little brother on a trip to the old Speke Airport in the late 1970s. Back then it was known as a "Take Two" ticket with "Saveaway" somewhere else on the advertising. It was a fantastic idea then, and 30 years later it's still as revolutionary. Of course, the "Saveaway" was open to abuse. I remember a gang of us kids getting on a bus in Crosby one day and passing the Saveaway to the kid behind, once it'd been shown to the driver. Or the first kid would race upstairs, and throw the ticket out of the window to someone below to use. MPTE tried to shore-up ticket fraud. They added the year to the scratch section, because I knew of people who'd use their tickets and keep them until the following year and use them again on the same date! The reason the sticky polythene fronts were added to the tickets was because if you were really clever, it was possible to glue a cut-out unscratched number/date over an existing one and use it again...and again. I know I did, once or twice. The other thing about Saveaways, particularly before the buses were deregulated, was the drivers just didn't give a toss whether the ticket's date was right/wrong/indifferent. Drivers at Ribble's Bootle depot hadn't a clue what month it was, let alone the day! I think the reason they're being gradually phased-out has something to do with "Plus Bus" - a nationwide ticketing system for both buses and trains. See, the rest of the UK has finally caught up with what MPTE cottoned onto over 30 years ago. You know there are times when Merseytravel's failure to embrace new technologies makes me hang my head with embarrassment. What's the point in issuing a ticket that can't be used in the barriers? Argh. Saving a ticket for a whole year is taking fare avoidance to OCD levels. You have to admire the dedication really. I'm guessing that bus drivers still don't give a toss so long as you wave a Saveaway at them. I doubt it's a tendency that's died out! The PlusBus is another of those schemes where I'd be interested to see it being put into practice - not just the expression on the ticket seller's face when you ask for it, but also the bus driver's when you flash it at him. (Of course I mean I'd like someone else to try it out - I'm not putting myself up for that humiliation). Excellently the Rail Ticket Gallery has some samples of Saveaway tickets in their PTE Ticket collection, including a Saveaway Take Two from 1981. The Take Two was a special family ticket which allowed one adult to take two kids along for the ride. And check out the price: £1.25! Now a single journey on Arriva will set you back £1.70. I'm frankly agog at that Railway Ticket site. Who knew such a beast existed? You really can find a website for everything. Still, it's nice to see that Merseytravel/Merseyside Transport have persisted with the same slanty logo for the SaveAway for thirty years, and to hell with corporate rebranding. I think they only activate the ticket gates at Chester during the peaks, Dave. Which always caused chaos when I worked there, because 90% of the people passing through were coming off Merseyrail trains with Railpasses and Trios, so they couldn't go through the barrier. Cue an enormous crush of people queueing up the stairs to get through a single exit.